With the ongoing debate about the legalization of marijuana making headline news, it seems as though a few people are tapping some of today’s top entertainers to weigh in on the controversial discussion. 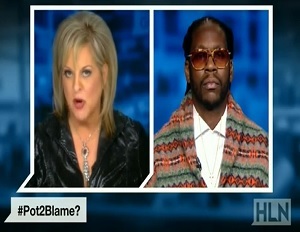 Tuesday night, HLN’s Nancy Grace invited rapper 2 Chainz onto her show to discuss the highly talked about debate. Introducing the Atlanta native by both his rap name and government name, Grace went toe-to-toe with the rapper about his reasoning for wanting to legalize marijuana. In between Grace’s showing of non-related 2 Chainz music videos, the talk show host also showed clips of parents willingly giving their children marijuana to smoke and she questioned the rapper on why incidents such as this don’t deter him from supporting the drug. Maintaining his composure throughout the interview, the Alabama State University alum who graduated with a 4.0 GPA, schooled Grace on why clips of parents wrongfully giving their children pot is a reflection of a very small morally wrong demographic, and how there is a bigger picture to take into consideration when discussing the marijuana business. 2 Chainz, who’s real name is Tauheed Epps, outlined a few benefits of the growing legalization of marijuana including freeing up tax payer’s money, eliminating the overcrowding of prisons and preventing some individuals from having a criminal record that holds them back from getting loans and buying homes. While the two ended the debate on disagreeing terms, 2 Chainz made sure to show Nancy love on Twitter and challenged Bill O’Reilly to have him on his show next. hey @NancyGraceHLN thanks for having me today!! We should make this a monthly thing what ya think? Check out 2 Chainz and Grace’s epic debate below and also check out BlackEnterprise.com’s coverage on black entrepreneurs cashing in on the marijuana business.